OSLO – 29 September 2018. Terra Seismic, earthquake forecasting Company, has been nominated for 2017 and 2018 Peace Nobel Prizes by over 130 university professors from 58 countries, an unprecedented number in whole history. The Company and its scientists were nominated “for their extraordinary achievements in global earthquake forecasting, aspiration and humanitarian efforts to protect lives of more than five billion people living in seismic/tsunami prone areas”. 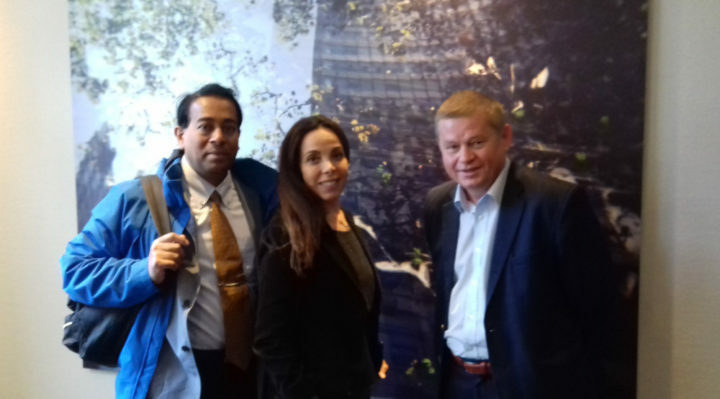 Norway News interviewed Oleg Elshin, Peace Nobel Prize Nominee, President & CEO at Terra Seismic in Oslo. Question: Oleg, please tell us about your Company. Oleg Elshin: As you know, earthquakes & tsunamis are number one global natural disaster. Earthquakes have killed 680,000 people just over last 14 years, and hundreds of millions more people have been affected globally. 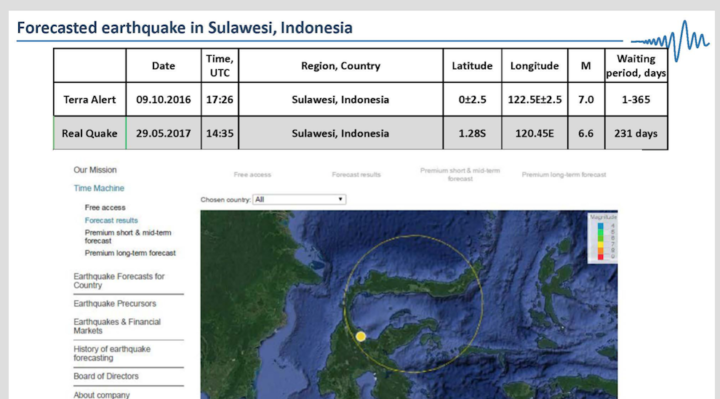 Terra Seismic was established in August 2012 with the purpose to resolve earthquake prediction problem and protect humanity from earthquakes & tsunamis. Question: But why earthquakes can be predicted now? Many people believe that it’s impossible. Oleg Elshin: You are right; Earthquakes were believed to be impossible to predict. Well, this isn’t the case anymore. We use US, European and Asian satellite systems to detect various abnormalities that occur before strong earthquakes. Thanks to our unparalleled Satellite Big Data technology, Terra Seismic can forecast most major earthquakes (M6.2 or greater) at least 2-5 months before they will strike. Our technology has been used to retrospectively test data gathered since 1970 and our systems successfully detected about 90% of all significant quakes over the last 48 years. So, earthquake prediction problem has been mainly solved. Exactly 200 years ago, Arthur Schopenhauer, a famous German philosopher, wrote “All truth goes through three stages. First, it is ridiculed. Second, it is violently opposed. Third, it is accepted as being self-evident.” Earthquake prediction looks impossible for many people, but science progresses and what was unbelievable or “impossible” yesterday becomes a reality today. Let me remind you of a few well-known cases. Just 500 years ago the world’s population strongly believed that the Sun revolves around the Earth. In 1772, the French Academy of Sciences ruled that “Stones could not fall from heaven” with respect to meteorites. In 1895, the President of the Royal Society Lord Kelvin wrote that “Heavier-than-air flying machines are impossible”, only to be proved definitively wrong by the Wright brothers just eight years later. People who think that earthquakes cannot be predicted will learn this is not true. Question: Could you clarify this a bit? Oleg Elshin: Of course. In fact, earthquake forecasting is one of most ancient skills known to mankind. The first known forecast was made by Pherecydes of Syros about 2500 years ago: he made it as he scooped water from a well and noticed that water, usually clean, had become silty and muddy. The earthquake did happen indeed two days later, bringing fame to Pherecydes. 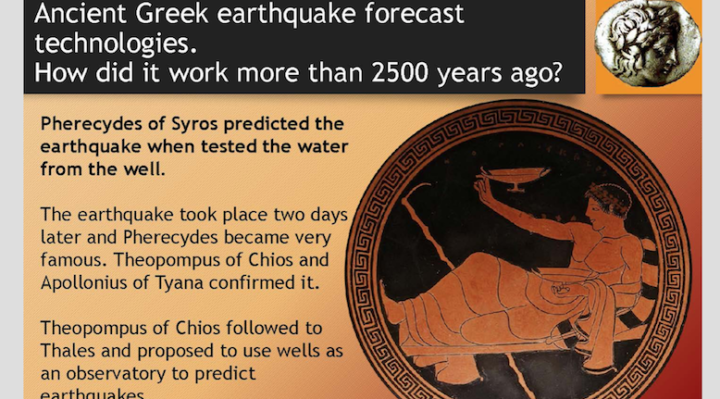 In ancient Greece earthquake forecasting was recognized science. Unusual natural phenomena, such as seismic clouds, behavior of living beings, etc. may be observed before many major earthquakes. Ancient Greeks were very close to Nature and were able to detect such phenomena and forecast earthquakes. If we had capacity to visit ancient Greece and ask local residents whether it’s possible to forecast earthquakes, the answer would definitely be “yes”. We have reliable records that earthquakes were predicted many times over human history. Nature sends warnings before major earthquakes. Say, snakes leaving their hiding places and appearing in the snow before the Haicheng earthquake in 1975 was one of the main factors for making the decision to evacuate the population and thus saving hundreds of thousand lives. 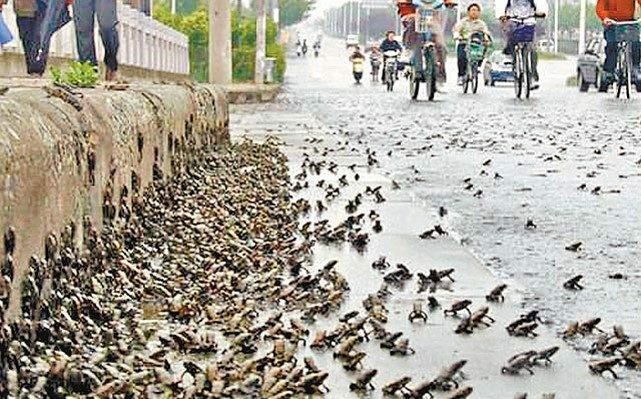 If snakes, frogs and other animals can predict earthquakes, why humans cannot do so? We can! Question: Why is Terra Seismic’s work so important for mankind? Oleg Elshin: Let me give you three citations from letters submitted by our nominators, university professors, to Peace Nobel Prize Committee. “After more than two decades helping companies to disrupt their industries, I found in Terra Seismic work, one of the most inspiring purposes with a huge positive impact for the mankind, it has the potential to become one of great “quantic jump” of the human history, as the printing press or space conquer. Earthquake forecasting will save millions of lives and provide a more predictable and secure future for people”. “Positive impact for the Mankind, to be realized by earthquake forecasting by Terra Seismic, has potential almost unrivaled in the entire human history. Earthquake forecasting will save millions of lives, provide safety & protection for billions, and prevent huge material damage and most dangerous catastrophes, such as the explosion of the Fukushima nuclear plant in the aftermath of Tohoku earthquake in 2011”. “Until now, humanity always thought that earthquakes could not be predicted, and would never be predicted. Thanks to their exceptional expertise and their hard work, Terra Seismic and its scientists are proving that an accurate probability can be associated with predicting and the advent of an earthquake in the coming several months, in a given zone. This will enable the population and the public authorities to take the necessary steps to avoid huge death tolls and damages in billions of Euros. Terra Seismic started to help governments in some of the most seismic regions of the world. The work of Terra Seismic and its scientists is a milestone in the history of mankind”. Question: Many scientists are working on earthquake forecasting/prediction. Why Terra Seismic resolved this historic problem? Oleg Elshin: We have few reasons for our success. Firstly, we accumulated all knowledge on earthquakes, their precursors and earthquake prediction methodologies from all sources available over last 2500 years. We have unique science team. Say, our Chief Scientist published the first article in this field 30 years ago. Secondly, we use innovative satellite Big Data technology and can daily analyze terabytes’ of information. Third, many scientists concentrate their research on a specific country/region, such as Japan, Italy, or California only. Thanks to Big Data we can efficiently analyze data from the whole world in almost real time. Fourth, we are very open-minded, we invent and develop completely novel theories and models. I graduated from Oxford, have seven degrees and have worked over seven years in global earthquake prediction. Finally, we are fully independent from many obsolete dogmas. We have a fresh look on the problem and thanks to this approach we made huge discoveries in this field. Question: Tell us about your Nobel Prize Nomination process. Oleg Elshin: In 2017-2018 we made presentation on Terra Seismic for 130+ university professors. After these presentations, over 130 qualified nominators – university professors from 58 countries (Italy, San Marino, Greece, Spain, Russia, Armenia, Kazakhstan, USA, China, Japan, Mexico, India, Canada, Turkey, Georgia, Ecuador, Bolivia, Colombia, El Salvador, Panama, Peru, Brazil, Costa Rica, Vatican, Nicaragua, Haiti, Azerbaijan, Serbia, Slovenia, Fjij, United Arab Emirates, Indonesia, Netherlands, Philippines, Honduras, South Korea, Uruguay, New Zealand, Argentina, Taiwan, Bulgaria, Romania, Chile, Dominican Republic, Nepal, Iran, Guatemala, Belarus, United Kingdom, Bangladesh, Macedonia, Kyrgyzstan, Uzbekistan, Algeria, Portugal, France, Singapore and Australia) nominated us for 2017 and 2018 Peace Nobel Prizes. We have support from reputable professors from famous European/Asian/US Universities, such as the world’s oldest Pontifical Angelicum University, Rome (est. 1222), Sapienza University of Rome (est. 1303), University of Turin (est. 1404), University of Catania (est. 1434), University of Barcelona (est. 1450), University of Westminster (est. 1838), Istanbul University (est. 1846), University of Auckland (est. 1883), University of Tehran, California State University, Northridge etc. We have well-known professors in earthquake forecasting/engineering among our supporters. Many of our nominators, university professors survived earthquakes. They submitted very argumentative and often tragic nomination letters. No one Nobel Prize winner in whole history has ever received such exceptional & argumentative global support. You can see some nomination letters on our site www.terraseismic.org. Oslo, Scandic Oslo City, 25th September 2018. Tad Gonsalves, Professor of Artificial Intelligence (Sophia University, Tokyo, Japan) and Aurilla Bechina Arntzen, Professor of Systems Engineering, (University of South-Eastern Norway) enjoy to know that Terra Seismic can predict earthquakes. Question: Why Peace Nobel Prize? Oleg Elshin: Earthquakes & tsunamis are number one global humanitarian problem and Peace Nobel Prize is a humanitarian Prize. Preamble of Alfred Nobel’s Will says that Nobel Prizes should be awarded “to those who, during the preceding year, shall have conferred the greatest benefit to mankind”. Preamble is a key legal part of Alfred Nobel Will and should be applied for Peace Nobel Prize as well. Alfred Nobel was an inventor and intended Nobel Prizes should be awarded for “the most important discovery or invention”. Terra Seismic’s discovery that major earthquakes can be predicted is the historic fit with Alfred Nobel’s Will. Peace Nobel Prize is also often given to persons who fight for human rights and/or for their efforts in humanitarian areas. The right for life is the paramount human right. Terra Seismic is launching global humanitarian projects to protect lives of billions of people in seismic prone regions. Then, Terra Seismic Nobel Prize will be brilliant fit with this tradition as well. Finally, Alfred Nobel’s idea for Peace Nobel Prize was to promote globally and support people thanks to whom massive loss of human lives would be prevented. Exactly this approach was used by Nobel Committee by awarding one of the worldwide most famous Norwegian, Fridtjof Nansen, for “[For] his work in aiding the millions in Russia struggling against famine” and “his work for the refugees in Asia Minor and Thrace” in 1922. Wars kill a lot of people and earthquakes & tsunamis are actually wars against mankind. Earthquakes kill 3-4 million people every century and thanks to Terra Seismic millions of lives will be saved every century and huge economic damage will be prevented. Positive impact from Terra Seismic’s work will last thousand years for all future generations. In the whole history of Peace Nobel Prizes, it’s difficult to find cases that fit so properly and simultaneously all above-mentioned criteria. Peace Nobel Prize should be given for the greatest achievements available. We have such greatest & historic achievement – we can predict many major earthquakes. 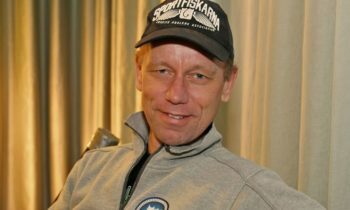 Professor Jukka Mähönen (University of Oslo) is happy to learn that Terra Seismic can predict major earthquakes. Question: Who will support Terra Seismic globally? 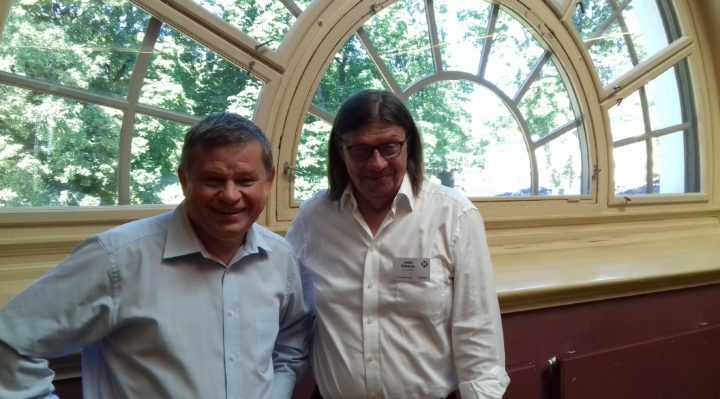 Oleg Elshin: Terra Seismic is backed by over 5 bn people living in earthquake-prone countries who share the public opinion that the resolving of earthquake prediction problem immediately deserves the Nobel Peace Prize. Therefore, we enjoy widespread global support and can collect the signatures of thousands of qualified professors from dozens of countries. And this support is growing every day! Question: Do you have support in Norway? Oleg Elshin: We have historically unprecedented global support and millions of Norwegians will also support us. We recently gave a presentation on Terra Seismic to Nikolai Astrup, Minister of International Development, Raymond Johansen, Mayor of Oslo, Gunnar M. Ekeløve-Slydal, Deputy Secretary General at Norwegian Helsinki Committee, Shirin Ebadi, Peace Nobel Prize Laureate, Arne Roy Walther, Former Ambassador to India and Japan, Kassandra Petsa, Vararepresentant for Nordland FrP, Stortinget, Allan Ellingsen, Vararepresentant for Nordland, FrP, Stortinget, Sigve Brekke, CEO at Telenor, Carsten Paludan-Müller, Former General Director of NIKU Norwegian Institute for Cultural Heritage Research, Aurilla Bechina Arntzen, Professor of Systems Engineering, University of South-Eastern Norway, Professor Jukka Mähönen, University of Oslo, Werner Dallawara, journalist at Nationen, Jan Erik Horgen, Owner at Horgen Consulting, executives at Innovation Norway, CICERO, Norwegian Red Cross, disaster preparedness & loss mitigation, sustainability and humanitarian professionals, many business owners & CEOs. After Terra Seismic’s presentation, The Minister Nikolai Astrup said he hopes that Terra Seismic wins the Nobel Peace Prize this year. We have enjoyed unbelievably strong support for our nomination in Norway as well. 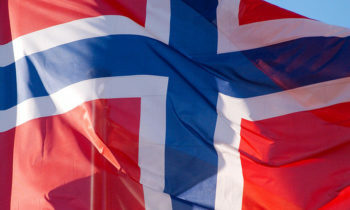 We recently received further positive responses from many influential Norwegians, such as Stortingsrepresentants Kari Henriksen, Ulf Leirstein, Aasland Terje, Tuva Moflag, and Rowena von Ohle, amongst others. Among recent responses: Så flott!! (Stortingsrepresentant), “This is very important work! Good luck!” (Stortingsrepresentant), “Dear Mr. Elshin Thank you so much for contacting me, and thank you for the presentation. 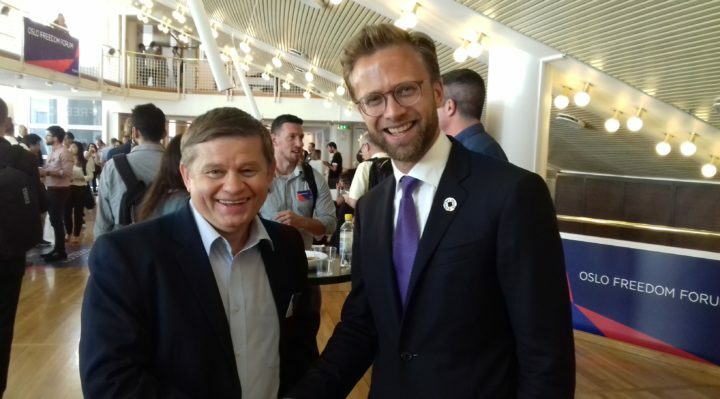 I have read your presentation with great interest.” (Stortingsrepresentant), “Veldig spennende å lese dette; og når man har Bodø så høyt så er det ekstra spennende å lese om hva dere får til! Lykke til; jeg krysser fingrene 😉 Mvh”, “Wow! Fantastic! I’m a huge fan of this in particular, working with Haitian refugees and immigrants in the Dominican Republic”, “Congratulations Oleg. I really hope you will get the Prize! Please let me know it there is anything I can do for you.”, etc. Terra Seismic’s story and 2018 Prize selection and Committee’s decision-making process will become a Hollywood blockbuster. Billions of people will know and will be very thankful to all humanistic people who support us in Norway. Question: How would humanity benefit from Terra Seismic earthquake prediction? 30–40 million lives could be saved. Earthquakes are responsible for 3–4 million deaths per century. Assuming humankind will still exist for the next 1,000 years, then Terra Seismic’s work will save 30–40 million lives. Extremely hazardous situations could be prevented. The Fukushima nuclear disaster in the aftermath of the 2011 Tohoku earthquake produced an economic loss in the scale of several US$100s billion and nuclear pollution in Japan and the Pacific Ocean. The negative effects of the disaster will be felt for many generations. Earthquake prediction could have prevented such large-scale disasters. Trillions of US dollars in economic costs could be avoided. Earthquakes and tsunamis produce trillions of dollars’ worth of economic loss every 20 years. Earthquake prediction is a game changing tool to dramatically reduce material damage produced by these perils. Thanks to earthquake prediction, states, businesses and people will be fully prepared and can avoid such huge financial impacts. Historic buildings could be preserved. Earthquakes cause immense and irreparable damage to the world’s historic heritage. As part of Terra Seismic’s action plan, we suggest reinforcing historic buildings in regions predicted to suffer a significant future earthquake, thus ensuring priceless heritage survives and is preserved for future generations. Put simply, earthquakes represent a solvable problem and we know how to efficiently eradicate earthquake danger from our Planet. Terra Seismic is the only candidate for the 2018 Nobel Peace Prize thanks to whom 30–40 million lives will be saved. 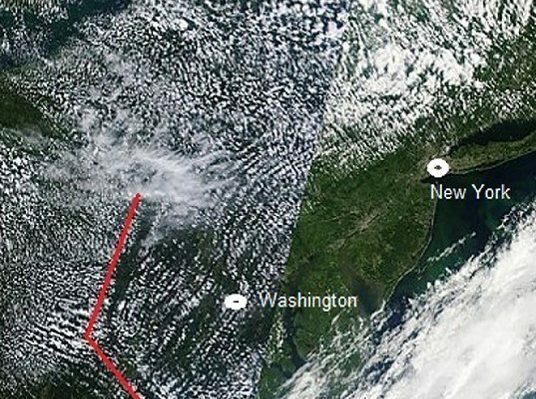 Earthquake prediction methodologies: Linear cloud anomalies three days before the Virginia M5.8 earthquake in 2011. See more on www.terraseismic.org. Question: How would Norway benefit? Oleg Elshin: The whole world would benefit greatly from Terra Seismic’s work, so would Norway and the Norwegian people. Let’s say migration is currently one of the Norway’s biggest problems. Major seismic activity forces people to leave their earthquake-prone countries and increases migration to Europe and Norway. Therefore, earthquake prediction will ease migration problems for Norway. Furthermore, Norway spends a lot of money on humanitarian aid and, again, mitigating earthquake danger on the ground will save a great deal of Norwegian money on humanitarian operations. Terra Seismic could help save the lives of up to one million people from earthquakes and tsunamis over the next 25 years. Norwegians are very active people, they travel a lot: 84 Norwegians were killed during the 2004 Sumatra megaquake. We can now offer Norwegians protection when they visit earthquake-prone countries. Finally, a 5.4 magnitude quake hit Oslo in 1904. Such events follow a recurring periodicity of 110–130 years, so there is a real chance Oslo could suffer devastating earthquake within the next 10–20 years. Skjelvet, a major blockbuster about the next major earthquake in Oslo, has been premiered since 31 August 2018. Norway, as is the case in many countries, does not currently have a public authority responsible for preparing for major earthquakes. Therefore, the next Oslo quake could kill tens of thousands, destroy historic buildings and result in economic damage estimated to cost up to US$225 bn. Terra Seismic can predict future major earthquakes in or around Oslo and help protect the city and Norwegians by dramatically mitigating its effects. The Nobel Peace Prize is given for a greatest contribution to mankind. Prizes are often awarded to people who are making efforts in resolving some global problems. We also have made efforts, but we can show much more – we have fulfilled an undeniably historic achievement. Such exceptionally positive events as real earthquake prediction happen once in centuries. After hopefully receiving the Peace Nobel Prize, we will have capacity to protect over 5bln people in all seismic prone countries. Then, earthquake danger will be greatly mitigated globally within next 1-3 years and forever. It’s possible now and should be done. 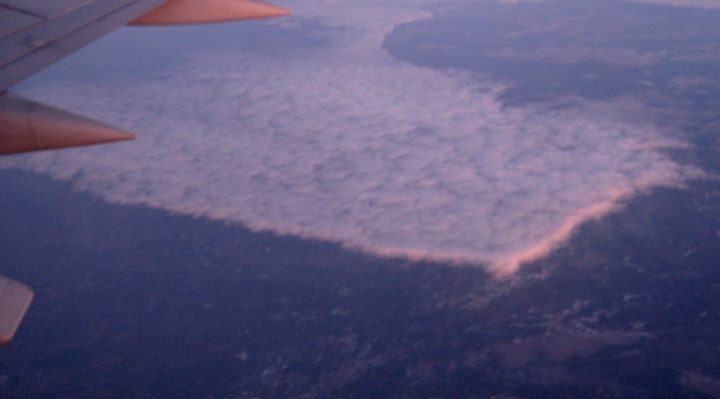 Rectangular-shape cloud before earthquake in Sakhalin. Question: Yes, I agree, I’m very impressed by your presentation. Do you have a scientific priority? Oleg Elshin: Yes, Terra Seismic’s scientific priority has been established and is indisputable following conferences in 2013 and two articles in Forbes, one in Le Monde and other articles were published in 2015. Bernard Marr, a best-selling author, wrote a book covering Terra Seismic’s case. 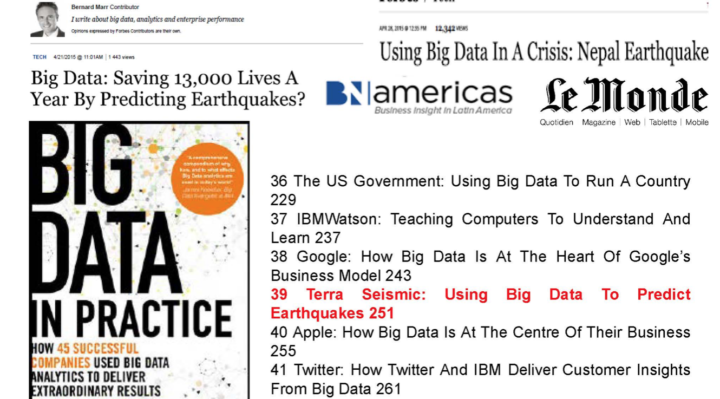 In his book, Marr ranks Terra Seismic between Google and Apple. Question: What governments and people should do before major earthquakes? Oleg Elshin: We need to act and be fully prepared. Terra Seismic develops action plans that should be implemented before major quakes. According to these plans the governments need to examine and reinforce the critical and important infrastructure in the areas of a forthcoming quakes – hospitals, schools, cultural heritage buildings, etc. Spending millions of dollars on effective loss prevention measures before earthquakes hit is estimated to save billions that are usually spent on recovery after earthquakes. Hence, thanks to Terra Seismic, trillions of dollars’ worth of economic damage due to earthquakes and tsunamis will be prevented and these huge savings can be used for other purposes. You would probably be surprised, but earthquakes by themselves do not kill many people. In reality, collapsing buildings are responsible for most deaths during earthquakes. The death toll would be significantly lower if people are outside and distanced from old buildings when the quake strikes. Thus, a timely warning for people to simply sleep outside buildings before major earthquakes represents a very cheap and effective solution. Training drills and early warning alarms will be enough to prevent massive human loss due to tsunamis. Based on Terra Seismic global technology and by applying just two of the aforementioned solutions, we can dramatically reduce the human loss arising from these awful perils. Terra Seismic is accumulating and will promote other inventions and solutions that can mitigate the danger of earthquakes. For example, we are aware of a novel Italian invention that prevents doors from locking during an earthquake. 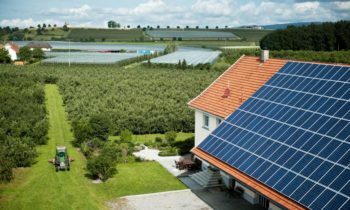 Other solutions, developed by Californian companies, can significantly reinforce buildings before earthquakes. Such effective solutions can be successfully implemented around the world in all earthquake-prone countries. Terra Seismic also develops and provides unique solutions for financing these preparatory measures. Question: Do you think that you need to give presentation to Nobel Committee as well? Oleg Elshin: Terra Seismic is a small organization. We are not as famous as President Trump yet and only limited information about Terra Seismic is available. The lives and safety of over 5 bn people are the paramount issues and mankind would expect that the Nobel Committee to know all about the only organization in history of Peace Noble Prize receiving over 130 nominations. The only way to learn all about it is to meet the company in person. Many people we met in Norway argued that Terra Seismic must make their presentation before the Nobel Committee. This August Terra Seismic team has very cordially asked to meet the Committee in Oslo to present our unique technology, humanitarian activity and strategy. Alfred Nobel’s Will does not include a direct prohibition against meeting candidates. Before Malala Yousafzai won the Nobel Peace Prize, she was invited to visit the Stortinget while she was only a candidate. In the film A Beautiful Mind, a Committee representative visited Prof John Nash before his Nobel Prize in Economics was awarded. By meeting with Terra Seismic, the Committee will show the whole world that saving human lives is always of paramount priority. Also, we are happy to deliver our presentation to the Norwegian Academy of Science and Letters, as well as any professors, scientists and MPs and business people who are interested in this topic. Question: Are your systems used in practice? Oleg Elshin: Yes, Terra Seismic obtained its first commercial client, a UK blue chip asset manager, in November 2013. So, our technology has been in practical use since that time. A top US earthquake insurer has successfully tested our global predictions over 3.5 years and became a Terra Seismic client in June 2015. We use our revenue to develop new generations of our prediction systems. Our paramount priority is to save human lives, protect billions of people, and mitigate economic damage produced by earthquakes & tsunamis. We make presentations, establish relationship with governments, Red Cross organizations, university professors around the world. Question: Do you think that the problem is so global and cooperation is needed? Oleg Elshin: You are right! We call for cooperation with all governments, aid organisations and all entities responsible for mitigating the consequences of earthquakes and tsunamis. We have made presentations to the San Marino Government and agreed upon on a collaboration and consultancy work. We also provide our prediction services to other governments. We have established a close relationship with over 150 university professors in 59 countries. Terra Seismic develops an action plan that should be implemented before major quakes. According to this plan the governments need to examine and reinforce the critical and important infrastructure in the areas of a forthcoming quakes – hospitals, schools, cultural heritage buildings, etc. It’s estimated that millions of effective investments in loss prevention measures before earthquakes will save billions that usually spent for recovery after earthquakes. So, thanks to Terra Seismic trillions of economic damage produced by quakes/tsunamis will be prevented and these huge saved funds will be used for other purposes. Terra Seismic is also launching global humanitarian projects to educate billions of people in seismic prone areas about natural precursors before major quakes to be better prepared and save human lives. Question: Peace Nobel Prize against earthquakes? Sounds great! Should Nobel Prize serve as a tool to mitigate and resolve earthquake problem globally? 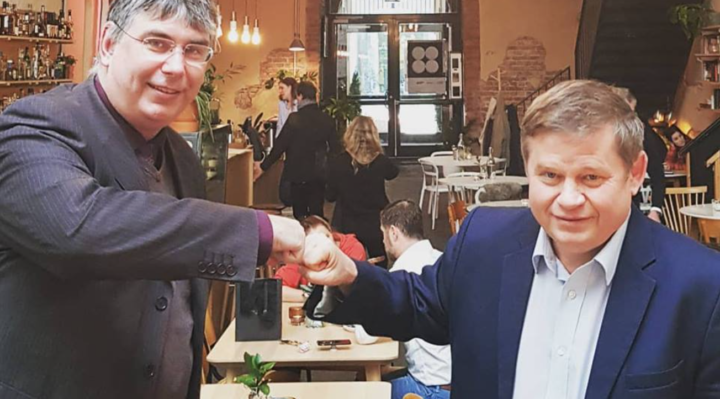 Oleg Elshin: Yes, Nobel Prize will create a unique chance to promptly expand Terra Seismic humanistic technology across all 100+ seismic prone countries. Terra Seismic’s Nobel Prize will serve as “silver bullet” and very powerful tool to mitigate and resolve earthquakes problem on our Planet. It would be a very special and invaluable award that would bring genuine protection for billions of people living in earthquake- and tsunami-prone areas and for which today’s and future generations will be eternally grateful to Norway and Norwegian Nobel Committee. This is very pressing and urgent issue, since earthquakes kill people in different parts of the world every 1–3 months. We live in era of increasing seismic activity globally. New huge tragedies are coming. The Norwegian Nobel Committee can now put an end to these tragedies, save untold lives of children, women and men who are destined to die from future earthquakes and start a new, more humanistic era in human history. The decision to award Terra Seismic will be welcomed by billions of people globally. We can predict major earthquakes – so, we know catastrophic future. Now thanks to Nobel Committee, humanity could greatly mitigate many future catastrophes. 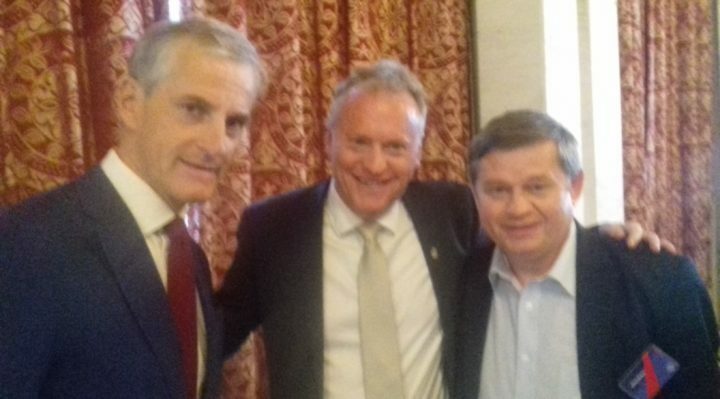 The Committee and Norway will become hugely popular globally and named after Norwegian Nobel Committee streets and squares will appear in seismic prone countries. Oleg Elshin: Thank you for your time & interest! And, welcome to new Earth, where major earthquake can be predicted!